What leaked for the other platforms? And yeah nintendo's been sloppy. I mean, Hyrule Warriors 3DS was Konami's fault apparently, but I can't believe Nintendo released a patch for Smash early in Japan. Of course, people knew by looking through Smash's files that Ryu was coming anyway. Last chance to get your predictions in, guys! Should we have another E3 chatroom this year? 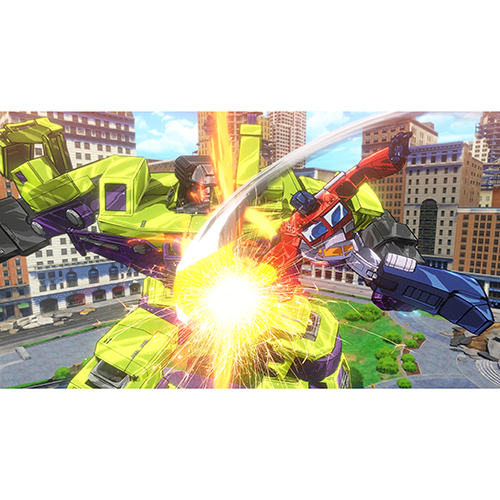 You guys haven't seen the new Transformers game by Platinum? Then there's the Tomb Raider sequel, Dishonored 2 confirmation, and Ratchet & Clank (not a leak but early video). I'm sure I'm still missing a lot of stuff. We got Metroid Primer Hunters! Errr, Blast Ball I mean. Did anyone watch the Nintendo World Championships? Arg, stuck at work, will watch the mayhem later. Yeah I just kinda skimmed through it and saw portions of all of it. Some of the bits were more fun than others. But the finale was spectacular and everyone should watch it. Mario Maker looks insanely fun. I guess I should've peeked at the NWC livestream instead of watching some of Bethesda's game trailers. Will definitely watch later. wowowowow! Wait! The transformers game is made by Platinum? I might have to buy that! Also, I want that 8-bit Mario Amiibo. If a predict a Metroid game will it come true? Big Boss in Smash? Zelda Gameplay? I am hoping, extremely hoping that Project NX has more than average horsepower when it gets revealed. All the games with the "First on Playstation" phrase kinda makes me wish these devs will somehow consider releasing their games on a Nintendo console. Seriously, I doubt FF7 will be released by 2016 as well as Shenmue 3, so Ninty has enough time to prepare their next console. And I don't think Nintendo joining the graphics race is gonna be good for them. Their games are extremely stylised so it matters very little how much horse power their console has (Mario Kart 8 genuinely looks as good to me as any Xbone/PS4 title). But of course it matters for 3rd party support... if the console sells. I don't think Nintendo has a fanbase to sell that well. They don't make deals with Western partners. They're not "cool" like MS and Sony. They're not for the 20something, it's a family company. The cheaper the console, the better. The only way they're gonna get bigger sales is by getting the non-gamer/casual to buy it, which is extremely hard with all the tablets out there. They only showed like 3-4 Wii U games, most of which we already know about since last year. I wonder if there's another closed-doors meeting. Whoever said "no 2016 games" should be fired. I don't even care if it was Miyamoto. Okay jk, but that was ridiculously stupid. I mean, why would people want to hear about the future of your console at a games event when you can make it seem as if you have nothing in the pipeline? Alright so let's look at the predictions we made: I nailed Mario & Luigi, Mario Sports title, Next Level Games project... that's about it. Not that I had that many predictions, but Nintendo still disappointed. I'm really surprised Nintendo didn't show new MK8 DLC. Or Devils' Turd. I got 2 out of 3!